I have a serious problem. 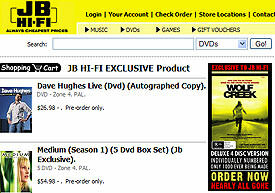 Seems I can’t pass within a kilometre of JB Hi-Fi without popping in to check out the DVDs. And then the reflexes kick in; I spot a film that interests me, pick it up and flip it over, my eyes instantly drawn to that most desirable of DVD phenomenon: the special features list. Special features are the DVD equivalent of a free set of steak knives. They’re the final incentive – the bonus ‘thrown-in’ to seal the deal. All you DVD-philes out there know what I’m talking about. ‘Vanilla’ editions (i.e. containing the film only — like a sundae without the nuts and chocolate fudge) should be avoided at all costs. You’re a collector, after all — make sure you’re getting a decent return for your investment. True, the appeal isn’t solely economic. Film buffs are attracted to the idea of expanding their bank of esoteric movie knowledge. Special features offer a way to do this. The irony is that if you’re anything like me, once you get the DVD home, no matter how noble your intentions, most of these special features don’t even make it off the proverbial shelf. I’m sure there are people reading this who can’t relate. These are the people who gritted their teeth and waded through every skerrick of additional info on the bloated four-disc extended editions of The Lord of the Rings. They’re people who, yes, have actually watched all three of the ‘alternate endings’ to 28 Days Later. If you’re one of these people, I’d love to know your secret (is it a Zen thing?). No matter how hard I try, I simply can’t do it. And I’m sure I’m not alone. Given that special features so often seem to get all the use of that extra set of knives you got with your copy of Mediocre Hits of the ’90s, you can’t help but wonder if we’ve all been victims of some cunning marketing ploy. It’s a fact that film distributors depend more on DVD sales than box office takings. According to the Australian Film Commission, wholesale revenue from VHS and DVD distribution reached $1 billion in 2005 (and you can take VHS out of that equation without affecting the final figures very much). In comparison, the distributors’ share of box office takings in 2005 was a relatively measly $817.5 million – a decrease of some $48.3 million since 2003. In other words, DVD sales equal big bucks. Can it be true? Have we, in our rush to possess a copy of every movie we’ve ever stayed awake through, been needlessly greasing the cogs of capitalism, blinded by the promise of an endless barrage of often not-so-special features? Of course, special features are not the extent of the money-makers’ bag of tricks. Next-generation technology is the next wave that threatens to part film lovers from their hard-earned cash. 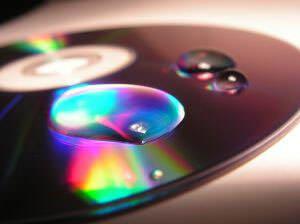 Promising five times the storage capacity of DVD, Blu-ray, for example, will allow for not only better sound and picture quality, but many more special features. Once they kick in, Blu-ray and its main competitor High-Definition DVD will no doubt take off with the same fervour as DVD before them. What does this mean for us addicts? Well, unfortunately it means the cycle of addiction will perpetuate. We’ll continue to use, while our dealers sit back and smile gleefully at the figures lining up in their bank accounts. Makes you wonder if, at the end of the day, we’d be better off kicking the habit, bypassing JB Hi-Fi and visiting the video rental store instead. I can relate ot this . Often not even watching the movie all the way thru ,let-alone the special features. $5 for a movie-hire that I wil not watch right thru ( probably) is far cheaper than $25 for a movie that I won't watch right thru . Why would you watch a movie twice - like why would you read a book twice . Why buy a video when you can rent it. I will usually rent a video rather than buy it, and never buy one that I haven't seen - but then, I watch a lot of movies twice (and re-read books as well), and would rather see a 5-star movie a second time than a 2-star movie once. Friends of mine use the 'rule of four' when buying DVDs: don't buy a DVD unless you're sure you'll watch it at least four times. Also, my nearest video libraries worthy of the name are 15-20 minutes away, so if I factor time wasted into the cost of hiring a DVD, it can be cheaper to buy a movie than to hire it twice, as well as more convenient. If a movie is sufficiently rare that I have to go even further and pay more (or may not be available at all), I'm even more likely to buy it. And when video libraries sell ex-rental stock for less than even one week's hire, of course I'm going to buy them!